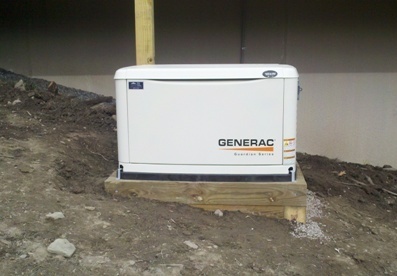 2) Another view of how we off load our air-cooled Generac Generators at a customer site. 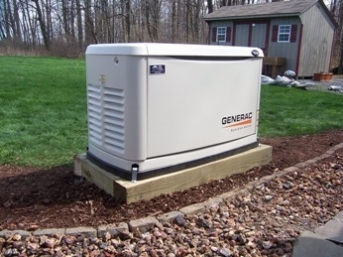 If you are getting a quote for a generator install, ask the contractor his off load and install method. 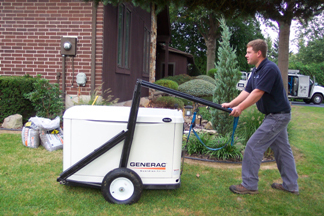 Most just slide the generator down a ramp and drag it across your lawn damaging the generator and your lawn! 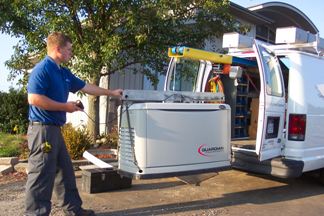 3) Another Home Power Systems designed moving device, our Generator Lift Cart. Designed and time proven generator lifting device used along with our Monorail Transport System, offers a complete professional installation method. One tech can load your generator at our warehouse, off load at your home and walk a 400lb generator to a prepared pad. 4) Here we are setting a 6″x6″ pressure treated wood base. This method is used for pitched grades or when the generator is installed in a landscaped mulch area. Getting the generator off the ground, using the timber base, prevents rusting and allows you to use your power lawn trimmer and not damage the enclosure. 5) Another method sometime used for our generator installs. This customer wanted the generator to sit in the gravel, not directly on the timber base. This base also used two – 6″x6″ timber bases for fear of high water that sometimes occur in her side yard. 6) Professional generator install on a very steep grade using 6″x6″ pressure treated timber. Notice how it is strapped down to the base using prime and painted steel fastners. Another time proven install method by Home Power Systems. 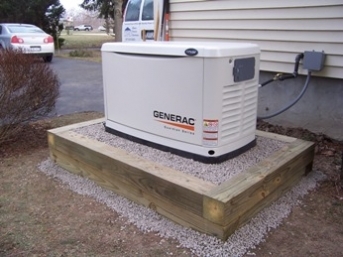 7) Generator install about 7′ from home using pressure treated timber base. Notice that we use this install method when sitting in a bed of landscape mulch. 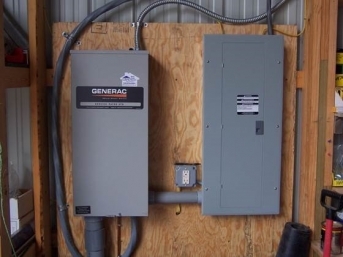 8) Home Power Systems underground install method for both natural gas and electrical raceways. Notice the gas valve is turned off for we are just finishing the installation. We use pre-manufactured gas sweeps for our installations, all direct buried utility approved. 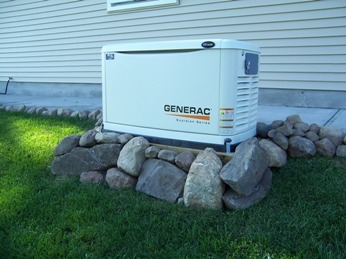 9) This customer added rocks around his new Generac generator to match his existing landscape theme. 10) This is our standard install method using a 3″ bed of pea gravel. We dig up the grass area, lay down landscape fabric and install teh pea gravel. Very clean looking installation. 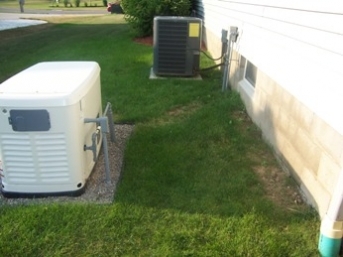 11) A side view of an underground generator install 5′ from structure. Electrical and gas raceways are straight and level at the generator and entering the house. 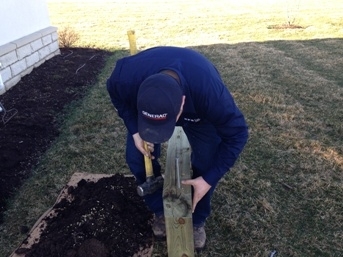 Workmanship is very important at Home Power Systems. This method is at additional cost from our base install but there are no exposed pipes or tripping hazards for children or pets. 12) This install uses a pre-cast concrete pad called “The Gen-Pad”. A new product that contours to the base shape of the generator creating a very neat and clean look for your Generac Generator. 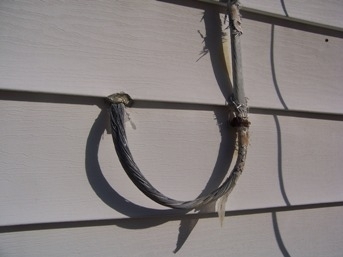 13) Does your electrical service entrance cable look like this on the side of your house? 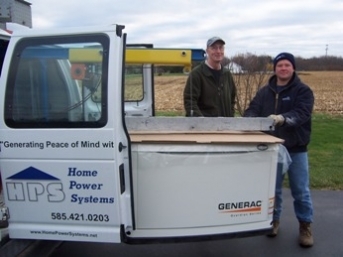 If so, Home Power Systems can replace or upgrade your electrical service while we are installing your generator. 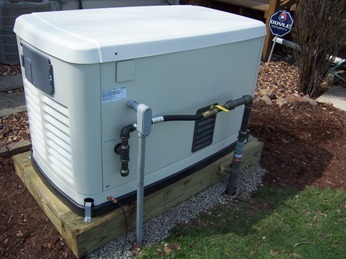 14) All of our natural gas powered generator installs require a dedicated gas raceway from the gas meter to the generator. 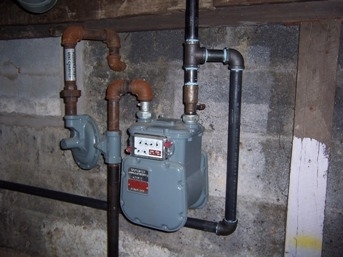 Tee tapping off an existing gas line to your furnance or hot water tank is not legal! Home Power Systems uses 1″ minimum size gas piping to your generator. 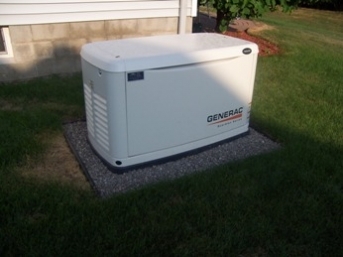 If you had a generator installed by another contractor, look at your install and see if it was done properly. 15) The gas meter on the right is a standard meter found in most homes. 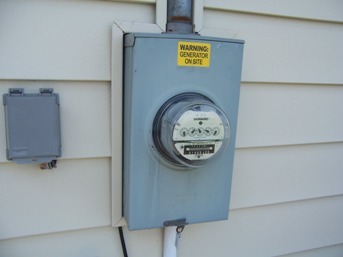 The gas meter on the left is an upsized meter used when 14kw or larger sized generator are installed in your home. All utilities require a gas inventory report to be completed when installing a new gas device to your system. 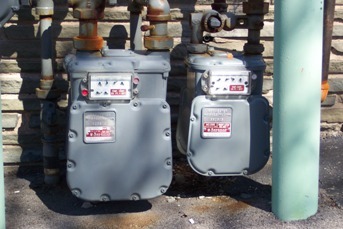 If your home total gas usage exceeds 350,000btu’s, the utility will install a larger gas meter like the one shown on the left. 16) All Home Power Systems exterior gas raceway is painted so your install looks professional and prevents the gas piping from rusting. Also, when we do maintenence on your generator, we will repaint your gas pipe if it needs it. It’s all about service and caring about your power plant. 17) Every install requires us to install a “Warning Generator on Site” sticker on the electrical meter. This is to inform the fire department that there is a generator on site incase thay have to cut your power. I hope these pictures help you understand the different install methods available. 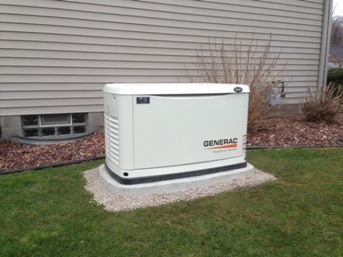 Home Power Systems, with nearly 4,000 installs, has led the industry in home generator installations in the Rochester and Syracuse, NY areas for over 15 years. Feel free to call us with any questions, we look forward to performing your new install or maintaining your generator installed by others.